Grind the biscuits into fine powder. Add drinking chocolate or cocoa powder and half quantity of powdered sugar to it. Mix them together. Pour little milk and knead this mixture to prepare a dough. In a bowl, combine desicated coconut, remaining powdered sugar, vanilla essence and butter. Mix well. The consistency of this mixture should be so that you can spread it over the chocolate base. Divide the dough and the stuffing into two equal parts. Place a transparent film or a butter paper on your kitchen platform. Take a portion of the dough, place it on the butter paper and using a rolling pin, roll the dough into a thickish (thicker than Indian bread (roti) or tortillas), flat, round shape. Spread the stuffing evenly on it and now holding the transparent film/butter paper, roll the chocolate layer. Let the film/paper be around it. Similarly prepare the other roll and refrigerate for two hours. Later remove the transparent paper and cut around 1/2 inch pieces. You can add some vanilla or chocolate essence in the chocolate dough too. 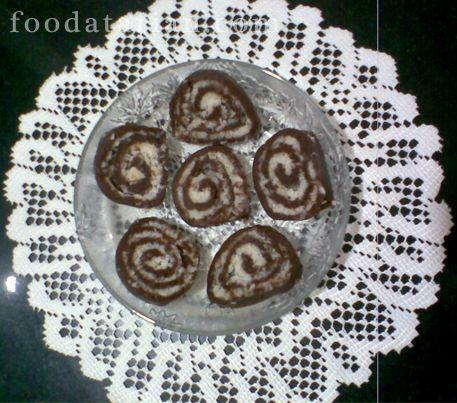 Happy to know that you have started with a sweet item “chocolate rolls”. All goes well in future.